Gunmen have opened fire on a busy market place in India's north-eastern state of Assam, killing at least 13 people, officials say. Police blamed the attacks on suspected rebels from a faction of the National Democratic Front of Bodoland (NDFB). 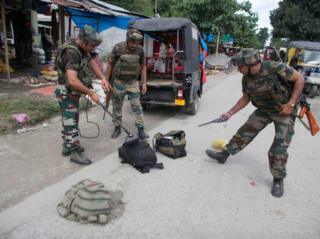 Reports say one suspected rebel was killed in the gun battle with security forces in Kokrajhar district. The NDFB wants an independent homeland for the Bodo ethnic group to be carved out of Assam. Assam police chief Mukesh Sahay told the BBC that the attack took place in a market in Balajan, an area just outside the town of Kokrajhar. "Many civilians sustained injuries when militants opened indiscriminate fire. They also lobbed grenades," he said. The banned National Democratic Front of Bodoland is one of many such tribally-based factions in India's remote north-east. The area where the attack happened already enjoys a degree of autonomy. But the insurgents want Bodoland to be given full statehood. There have been years of sectarian and ethnic clashes there and hundreds of thousands remain displaced from their homes. One gunman was killed by the security forces and troops were pursuing five others who had fled. Several homes and shops were damaged in the attack. In 2014, NDFB rebels killed at least 62 people in Sonitpur and Kokrajhar. The Bodos now have an autonomous territorial council which one of their parties, the Bodoland People's Front (BPF), controls. The council offers considerable local autonomy to more than 3,000 villages that are home to Bodo tribesmen. What lies behind Assam violence?